Cop Out directed by Kevin Smith provides the potential for horrible puns if it flops critically – fortunately for both Smith and I, I’m not going to make such a pun as I found the movie to be a fun popcorn film that provided more laughs than found in the trailer – a rare feat. 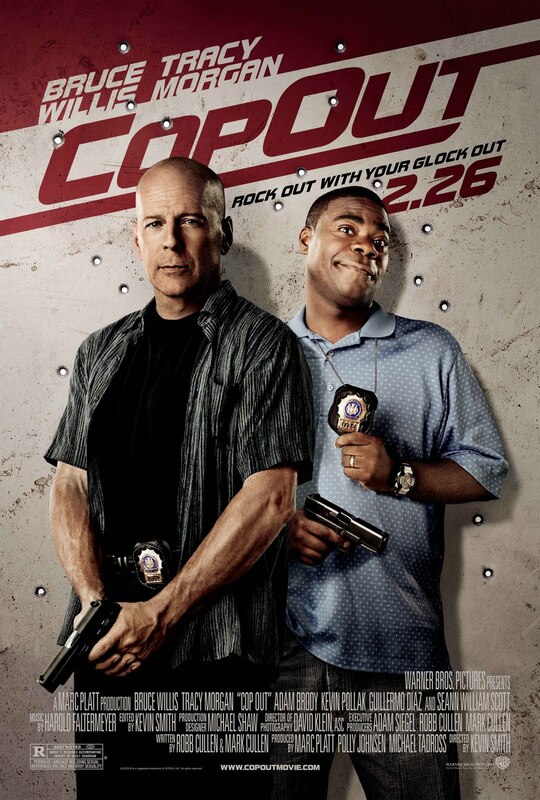 The film follows longtime New York detectives Jimmy (Bruce Willis) and Paul (Tracy Morgan), as they investigate Mexican drug runners and the theft of Jimmy’s $80,000 baseball card. We follow the duo on a variety of misadventures as Jimmy worries that he won’t be able to pay for his daughter’s wedding without having card to sell, and Paul worries that his wife is cheating on him. This film combines elements from Lethal Weapon (classic Buddy Cop action with characters you can care about), Clerks (snappy dialog between Buddies) and… Taxi (doing a goofball Buddy Cop Comedy when just about every goofball Buddy Cop Comedy variation has been done. To death. Again.) Did I mention this is a Buddy Cop Comedy? That said, we really do feel like Jimmy and Paul ARE buddies which is a great testament to this film. If we didn’t, this film would have flopped straight out. The dialog is overall very snappy, and much of the humor comes from the interplay between Willis and Morgan. Repeat Smith cast members include Sean William Scott (Jay and Silent Bob Strike Back) who turns in a humorous supporting role as a cat burglar and Jason Lee (Jay and Silent Bob Strike Back, Clerks II, Jersey Girl, Dogma, Chasing Amy, Mallrats) as the new, rich husband of Jimmy’s ex-wife. This film is recommended for anyone who is interested in seeing a Buddy Cop Comedy, one made by Kevin Smith or otherwise. It’s nothing more and nothing less. Kevin Smith “purists” might be upset that it’s not a witty indie drama by the guy who helped define the genre with Clerks and Chasing Amy. But as a director, taking a risk in another genre (it’s a Buddy… oh, never mind…) and pulling it off is sign of skill and Smith should at least get points for trying something new. For this director making a film out of someone else’s screenplay, here Robb Cullen and Mark Cullen, Smith has definitely moved out of his comfort zone as all of this other films were self-penned original screenplays. It will be interesting to see what his next movie will be and how this movie will fit in to his overall filmography. Is this movie Clerks? No. No, it’s not Zack and Miri either. It’s Kevin Smith doing a Buddy Cop Comedy and about as well as can be done in 2010. One can’t help think that he could have turned in a film that seems fresher due to the immense talent of all involved, but this film is nowhere near unwatchable. I laughed and laughed frequently, so the film overall worked for me, for what it was. If you expect a cop comedy that provides laughs, you will likely enjoy yourself.